A two Judge Bench of the Supreme Court Today in Richa Mishra v. State observed that Women in this world, and particularly in India, face various kinds of gender disabilities and discrimination, and Women empowerment is the need of the hour. The Bench comprising of Justices A.K.Sikri and Justice A.M.Sapre was hearing an Appeal filed by one Richa Sharma who was denied the post of Deputy Superintendent of Police in Chhattisgarh Police. A two Judge Bench of the Supreme Court reiterated that to enable the police to start investigation, it is open to the Magistrate to direct the police to register an F.I.R. and even where a Magistrate does not do so in explicit words but directs for investigation under Section 156(3) of the Code, the police should register an F.I.R. A Division Bench of the Supreme Court on Monday upheld EmamiLtd’s allegations of disparagement against Reckitt Benckiser (RB). The Bench, comprising Justice Ranjan Gogoi and Justice Prafulla C. Pant dismissed the appeal challenging the injunction against an advertisement of the pain ointment Moov manufactured by Reckitt Benkiser. A two Judge Bench of the apex Court on Friday quashed a resolution passed by Tamil Nadu Legislative Assembly suspending DMDK MLAs for breach of privilege. The Bench comprising of Justices J.Chelameswar and Abhay Manohar Sapre has held that while taking action against the MLAs, the requirements of Article 14 were not complied with. The Supreme Court on Friday, declined to quash criminal proceedings against Congress president Sonia Gandhi, vice-president Rahul Gandhi and five other party leaders in the National Herald case and asked them to raise all their objections and contentions in the trial court before framing of charges. The Supreme Court on Friday, asked the Ministry of External Affairs to consider appointing a nodal officer for better co-ordination with Baghdad and international agencies for securing release of 39 Indians taken hostage by ISIS one-and-a-half-years ago from a construction site in Iraq’s Mosul. 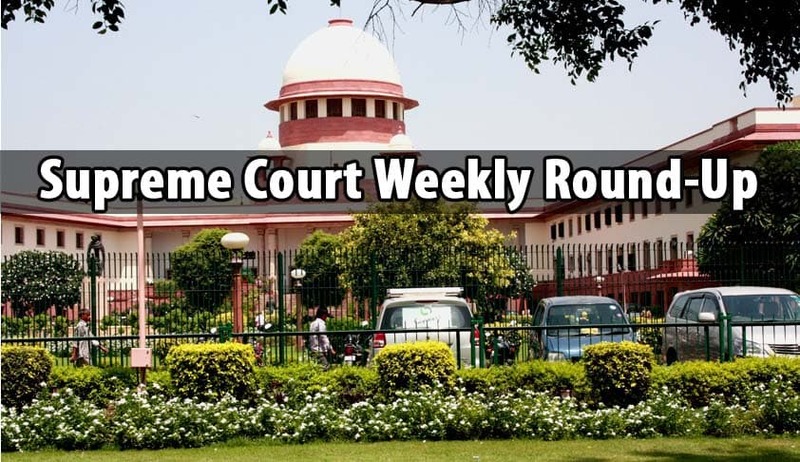 A three Judge Bench of the Supreme Court of India appointed a high-level committee to carry out a nine-point scrutiny of the functioning of the Consumer Protection Courts and suggest remedial measures. The Supreme Court commenced a hearing to re-examine the anti-defection law, which lays down rules for disqualification of MPs or Members of state assemblies for crossing the floor during voting on any particular issue. Supreme Court of India on Thursday, upheld the Gujarat High Court Judgment which approved the ‘mobile internet ban’ by Gujarat Government during the Patel quota agitation in the state. A two Judge Bench of Supreme Court on Thursday, referred the matters to be decided by a larger bench to resolve the issue whether drivers having licence to drive light motor vehicles is required to obtain a prior endorsement to drive the transport vehicle even when the transport vehicle is of class of light motor vehicle.